We have quite a spider hanging out on our balcony. It's become the neighborhood attraction. It's been a long week... Our 12 year old neice will be staying with us for a few weeks as her mother has to (unfortunately) work a 3rd shift as part of her training for a new job. Madison and I had a lot of fun the other night making some jewelry for a class project. It's definitely been an interesting week thus far. After having a Catagory 1 hurricane force winds hit us the day after Ike in Texas, most of Cincinnati was left without power on Sunday afternoon. And Monday and some people still don't have power. Like my office of employment. I have yet to work this week. (Darn!) This may have been a good thing, because there are only so many gas stations with electricity and they are running out of fuel. Luckily the grocery and bank finally reopened. With the number of trees split down their middles and landing on houses and cars, all over the roads, for a little while on Sunday it looked as though we had been hit by a hurricane. Just without the water. 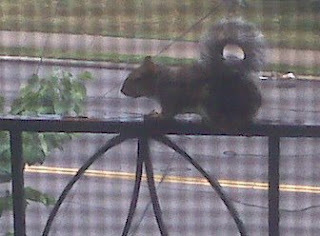 The picture isn't great because I had to take it though the window and screen to avoid scaring the squirrel away. But he visits often, though never when the door is open. He likes to climb over to the roof of the house to our left, next to our larger window, where the cats like to sit. He runs back and forth toward our window which drives the kittens... nutty.